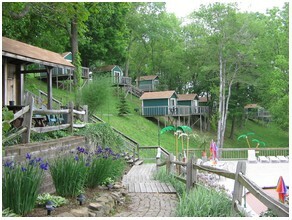 Truly one of the nicest and friendliest gay camping resorts in the USA. 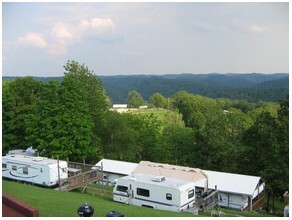 Roseland is unique from other gay campgrounds in the USA due to the fact that it is located on the top of a mountain. Most of the permanent sites are erected on stilts, on the side of a mountain ridge. Seasonal campers must have their trailer brought in by special equipment, believe it or not. Needless to say, the views are awe inspiring. Roseland is gay owned and operated and caters to gay men. On the grounds clothing is optional. Roseland offers a range of accomodation, including bed and breakfast style guestrooms, army-style barracks, sleeper cabins, deluxe cabins with full kitchen, tent sites with water and electric, transient trailer sites, and trailer sites to rent by the season. Rates include breakfast and dinner for Guestrooms and the Barracks, however cabin and tent campers may purchase meals at an additional charge. Roseland's kitchen is fully equipped, and the restaurant is an inviting addition to the main guesthouse. The pool area is brand new, and is a wonderful place to soak up the sun or simply people watch. The theme is "Santa Fe" and the neon cacti and palm trees add a nice southern feel, without bordering on tacky. 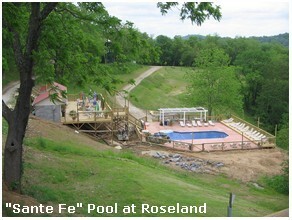 Roseland is a very friendly and social place, and the pool area is a great place to meet new people. 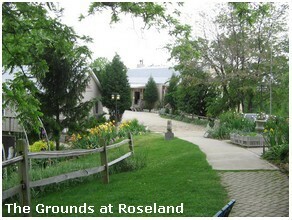 Hats off as well to Roseland's talented team of landscapers. 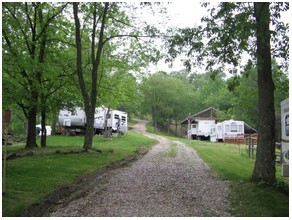 The campground and common areas are beautiful and impeccably maintained. One particularly interesting feature is the main shower area. One wall is almost entirely glass, allowing you an unobstructed view of the valley below as you shower. Note: Since Roseland is situated on the top of a mountain, it's accessed only by steep, narrow mountain roads with lots of switchbacks and few guard rails. Driving or towing an RV to the top is not for the faint of heart. If you are thinking of bringing your RV to Roseland, Gay Camping USA recommends that you discuss what kind of RV you are thinking of bringing with Roseland's staff or management before attempting the drive up the mountain. Roseland offers cabins, bed & breakfast style guests rooms and many shaded and spacious tent sites as an alternative to RV camping. Do you know of a great gay campground in the USA you'd like to suggest as a featured campground? Let us know - leave a comment below. � Copyright 2010 gaycampingusa.com. All rights reserved. Email infoATgaycampingusa.com. gaycampingusa.com is an informational site only. Read our disclaimer.